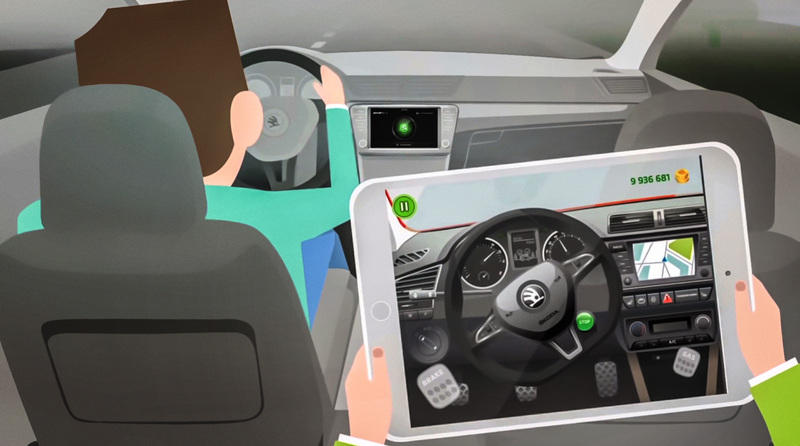 The LittleDriver app lets those in the back experience what it’s like to be up front. Quite literally an acceleration of in-journey entertainment, LittleDriver is a great little game – a bit like a flight simulator, but with the crucial difference that it uses real-time data supplied directly from the car’s computer system while the vehicle is in motion. The aim is for the player to “drive” the car, and make exactly the right decisions in steering, acceleration, braking and so on as the actual journey progresses. The app draws on data from the car, thanks to ŠKODA’s SmartGate and SmartLink software, which hook smartphones and tablets up with the vehicle, enabling a two-way flow of information for media, entertainment and important info. Supplied with real-time input, the person playing LittleDriver has to mimic turning the wheel or braking at the right moment, and make other driving judgments. The more accurate the player, the higher the score. Aimed at children between 9 and 12 years old, LittleDriver has some fun features too, such as a realistic ignition start-up and driving sound – and its virtual dashboard offers the feeling of a front-row seat. It’s also educational, with an emphasis on safety. Players win bonus points for following the rules of the road, and there is an extra learning feature with a quiz about safe conduct and traffic rules. The quiz provides instant feedback, and a wrong answer leads to another learning task. But be careful, after a few games they might want the keys to the car.